Paraic O’Donnell’s debut novel The Maker of Swans was one of the standout fantasy novels of 2016. In a genre that often deals in warmed over tropes, The Maker of Swans was a work of beguiling originality. So the question was, how would O’Donnell follow this debut up. Much like another debutant of the previous year, Natasha Pulley, he does so with an emphatic change in direction which maintains the features that made his debut so enjoyable. The Maker of Swans was set in a more contemporary time but always had the feel of a more Victorian novel. 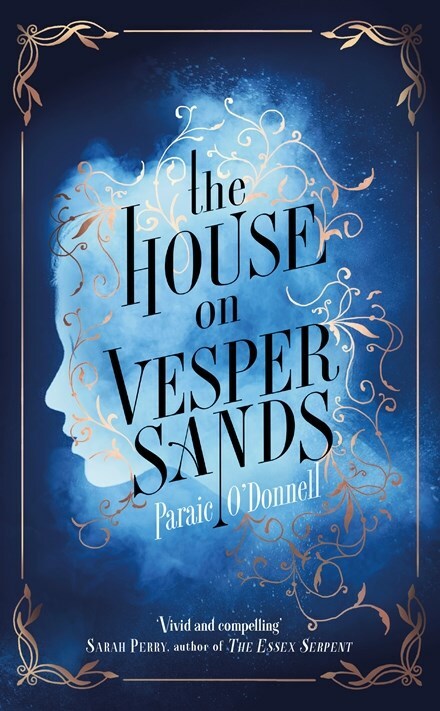 The House on Vesper Sands is Victorian so allows O’Donnell more licence to lean into period flourishes (also drawing further comparisons with Pulley’s works which are both set in this era). In the cold open a seamstress, suffering from some undisclosed medical condition, who is brought to the house of Lord Strythe late at night to complete a secret commission commits suicide. The story proper opens with young Gideon Bliss coming down from Cambridge to see his uncle and failing to find him runs into a young woman from his past. At the same time, society reporter Octavia Hillingdon has happened on to what could be a big story involving missing girls. The two end up coming at the same mystery from different angles, Gideon by attaching himself to a police detective and unwittingly joining the police. There is a fantasy element at work here. Strange cults, noxious potions, rituals and rumours. But much like the Maker of Swans, the details are kept well in the background for most of the book. O’Donnell is more interested in the mystery surrounding these fantasy elements and those who are investigating it. Alongside this mystery there is action and a sly sense of humour at work along with an array of colourful side characters including Charles ‘Elf’ Elphinstone, and Inspector Cutter, who takes Gideon under his wing and teaches him the art of policing, Victorian style. The House on Vesper Sands confirms the promise shown in O’Donnell’s debut. Together with authors like Natasha Pulley, Andrew Caldecott and AK Benedict, O’Donnell is breathing new life and new perspectives into what is uniquely British fantasy.